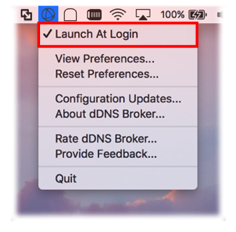 Due to its function, dDNS Broker should be running all the time, and it needs to be re-started after every login. However, since it typically runs in the background, we tend to forget about it. Therefore, it is best to set it up to launch automatically at every login. When the application is launched for the first time, it provides an option to enable automatic launch at every login. If you said no to that option, or do not remember your choice; don't worry: click to the status bar menu and select the "Launch At Login" option as shown in the figure to the right. One of the unique features of dDNS Broker is that it can operate independently on each active network interface. To configure this capability across multiple network interfaces, please refer to the Monitoring Network Interfaces tutorial. Once you decide which network interfaces you would like to monitor for public IP address changes, customize the preferences for each network interface to display their headers only. Then check the monitor checkboxes for the network interfaces you want to monitor, and uncheck for the ones you don’t want to monitor. Please refer to the figure at left to locate the minimize buttons and monitor checkboxes. Now, it is time to create dynamic DNS service records for services accessible from each network interface. For example, you may have a web server accessible from the Ethernet network interface, and a game server accessible from the Wi-Fi network interface. To create a service record, please select the "Add" button from a group of buttons below the service records table, as shown in the figure at left. The dynamic DNS records that are updated upon detection of public IP address changes are described using "Service" records. These service records define the dynamic DNS service provider, and the credentials required by that service provider. For every monitored network interface, you need to create a set of service records. Figure at right depicts a sample service record dialog. 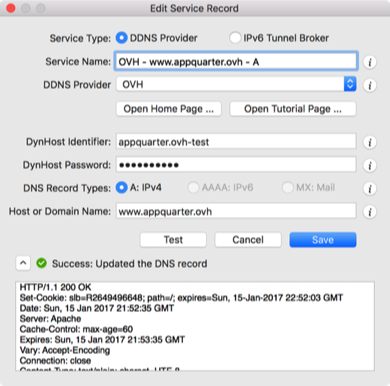 Mutually supported dynamic DNS record types are presented in the service record dialog as well. The dynamic DNS record update function can be tested by simply clicking on the "Test" button. Congratulations! You have completed the initial setup of dDNS Broker. 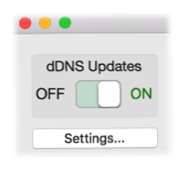 Now you can turn on the dynamic DNS update switch of dDNS Broker and track the application’s activity. For further optimization, we recommend you take a few minutes to peruse the Settings dialog box, as well as the Preferences for Active Network Interfaces table, paying close attention to various notification options.